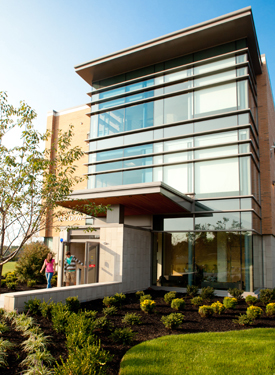 The Autism Center at Misericordia University is comprised of a number of services that offer care, treatment, and services to people on the Autism Spectrum of Disorders across the life-span. The services are offered by highly trained and credentialed professionals, along with graduate and undergraduate students in programs that reside in the College of Health Sciences. A major goal of the Autism Center is to offer that highest quality services available, while endeavoring to establish services and programs based on community needs and to fill gaps in care. The Autism for Lifelong Learning (ALL) Program at Misericordia University: A licensed program that provides pre-employment and employment services in the context of community integration and self-determination at the post-high school level. The ALL Program Transition Services: providing transition services to students aged 14-21 through instructional group and individual services in the public schools. Services are also available and offered at the college level. 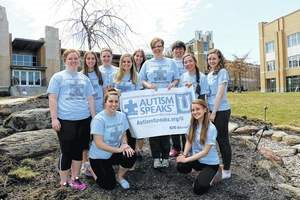 Autism Speaks U is a multi-disciplinary club here at Misericordia! The club's main objective is to spread awareness, and educate others about autism. Autism Speaks U holds meetings, runs fundraisers, and hosts events around campus in order to meet their objectives of raising awareness and educating others! 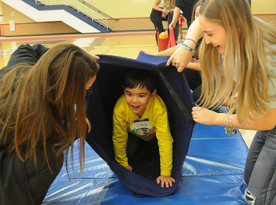 Click here to see the exciting and fun filled day Autism Speaks U had at their first "Gobble till you Wobble Event" in 2015! On April 2, 2016 Misericordia chapter of Autism Speaks U honored World Autism Awareness Day by assisting at the Autism Family Fun Day at the Pittston YMCA. Dr. Lori Charney, OTR/L is the group faculty advisor. Please contact her with any questions at 570-674-3330 or email at lcharney@misericordia.edu. 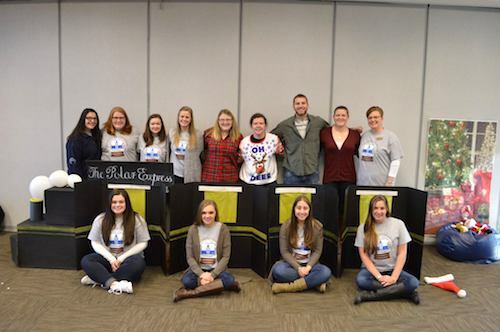 Misericordia University students hosted an Autism Speaks U Sensory Winter Wonderland to raise awareness for Autism Speaks on Sunday, Dec. 3 from in Sandy and Marlene Insalaco Hall at Misericordia University. 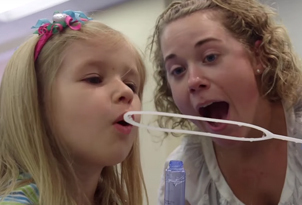 Our Speech-Language and Hearing center treats both children and adults with a variety of challenges, including autism. Click on the link above to learn more about the services provided at the center. Please click on the links below to see the programs being offered during the summer of 2017. 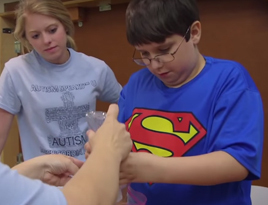 Sensory social camp is held at Misericordia University in the Occupational Therapy (OT) labs during the month of July. It comprises 15 OT treatment sessions where children with autism are encouraged to learn good social skills and strategies to deal with their sensory challenges. The group incorporates a fun, play-based environment that embeds the challenge to the student to use pro-social behaviors throughout each activity. (Child is taught a social skill and is required to use that skill throughout the camp, as each social skill builds upon the next). The group atmosphere allows the children to learn from one another as well as build friendships with each other. Each session begins with learning and trying out a social skill with the group through a fun activity. Then, the children complete a “sensory obstacle course” where they complete gross motor activities and sensory challenges. Next, they complete a “sensory craft” such as making weighted animals, scented beans, colored rice, calm down jars, etc. Throughout the entire camp, they complete 15 different sensory crafts which they compile into a “sensory toybox” to take home or to school. Parents are invited to attend the final session of camp where they will be educated in the use of each item to assist them with their child’s sensory challenges. Each session ends with a “sensory snack” where the children learn about tolerating different textures in their mouth and proper snacks to choose in order to help the child be more alert and focused. talk to a friend appropriately. ask a friend to play a game. encourage friends during game play. identify their own emotions, as well as those of their peers. “stop, think and make good choices” when they are upset. use sensory strategies to be more alert and focused. Improve their ability to follow multi-step directions. choose good methods to calm their emotions when they become upset. maintain an appropriate topic of conversation with a friend. reduce restrictive repetitive behaviors (known as stimming). 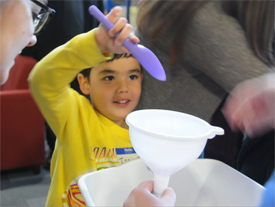 use sensory strategies at home, in the community, and at school. Adolescents and Young Adults aged 16-21 on the Autism Spectrum of Disorders and currently enrolled in school. The primary focus of the program is to provide adolescents and young adults on the ASD with the skills they need to successfully transition to adulthood and the work environment. The Autism Center at Misericordia University recognizes that the greatest barriers people on the ASD face in obtaining and maintaining employment are social skills, communication skills, and the inability to self-advocate. Emphasis on these critical skills will be presented. Staffed with aides and volunteers. Summer reports will be provided to parents and sending school districts. New government survey finds 1 in 45 children 3 or older have been diagnosed with autism. Click here for information about the Graham Academy. On Tuesday, February 26, 2019, Kerry Magro will be coming to our campus to speak. The Autism Center will be hosting the event. To see more on Kerry Magro, click here. Most of the services of the Autism Center at Misericordia University have specific, individual contact information for each service. Please consult the links in each section for information. Persons with general questions may email us at autism@misericordia.edu. The Autism Center has recruited members of the community, university personnel, parents, and school and treatment professionals to form the Autism Center Advisory Board. Click here for information on vocational resources! "The primary purpose of this conference is to disseminate information in the spirit of collaboration to continue to enhance the quality or services and resources, especially for adults on the autism spectrum attending college". Click here for more information on the Mercyhurst Conference.